So, on the Sunday of President's Day weekend, just after last year's Challenge, I was in the backyard admiring my livery stable and wondering how to go about preserving it on my layout in its then-current state of burned-outness when I noticed that there were now three livery stables and they were at weird angles to each other. Thinking this might be something of interest to post on my Facebook page, I decided to call my HMO. Four doctors later, three surgeries (two of which were emergencies), numerous laser treatments, some of the most intense pain I have ever experienced, and my fourth and hopefully final surgery coming up January 17 (having been postponed from November), I'm excited to join in again this year. I have not done any significant modeling since last year's Challenge. What I have been able to do over the last few months, however, is to oversee the renovation of our mid-century suburban modern house into an Arts and Crafts revival home. So I think I'm going to build a Craftsman home for the layout. Not sure what form its going to take yet, but that's the plan. Great to see you back, Greg. If you build this bungalow, buy fire insurance first! Glad your her. Your year sounds about like mine. All in all, it was still a good year and I am glad to be coming back to modeling with plastic. Although I am really enjoying 1:1 woodworking, with 1:24 plastic the splinters aren't near as bad! sounds like an expensive (in every sense) way to triplicate one's scenery. Hope the surgery on the 17th goes well and you have a quick recovery. Glad to see you take up Mik's challenge. I enjoyed your build (and destruction) last year and look forward to following along this year. Thanks, guys. I'm pretty sure there won't be any fires this year, but you can't predict earthquakes. Korm, not completely healed yet but hopefully soon. The detached retina has been repaired but early on in the process of the three surgeries, the lens in the front of the eye was removed. Thus, I have had limited vision in the right eye ever since, including a loss of depth perception. The surgery on the 17th is to insert a new lens and, unlike most cataract surgeries, stitch it to something. I was all set back in November -- had the IV in my arm and everything -- when they discovered the special order lens had not arrived. I will be making sure the lens is there before showing up this time! Greg, hopefully see you Saturday, February 9 at the BAGRS meet in San Carlos! Mike, yes, I am planning on being there. Even if the eye is still a problem, I have learned to drive and function over the last year with one eye closed. Whew! I thought I had until tomorrow. Anyway, I will be building a sort-of Craftsman style house (a poor picture of which is below) and with a twist. Next door to the livery stable from last year was this weird water pump, windmill thingy that I will also be adding to the project, minus the creepy people hidden in the photo. 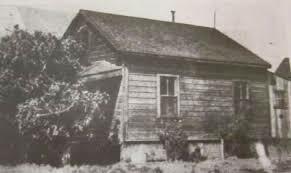 The prototype of the home belonged to a very prominent family in Martinez, which I will reveal at a later time. Now, where's my damn napkin? I’m back! Yesterday’s eye surgery went well and while there is still some swelling and the vision is a bit blurry, there is already a vast improvement and it will continue to improve over time. So I’ve got some catching up to do and I’m anxious to really get started. And from the look of things, there is some incredible modeling going on! Congrats, Gregory! Glad to "see" everything is "looking" up! Well, as you can probably tell from my lack of progress updates, things just never got off the ground this time. Even though the eye surgery was successful, there is still enough distortion in my vision that made it difficult to do any kind of finescale modeling. So, I am still going forward with my project but just can't get it done by the challenge deadline. But I'll be back next year! Eh, contest shmontest. The important thing is to get your eye to work. Best of luck!